Matt Neal scythes to second-place finish at Donington Park Gordon Shedden denied victory by technical infringement Halfords Yuasa Racing remains firmly in BTCC title hunt Matt Neal claimed a popular podium finish on home turf in the Dunlop MSA British Touring Car Championship at Donington Park this weekend (15/16 April), but late misfortune for his Halfords Yuasa Racing team-mate Gordon Shedden cost the Scot the standings lead. After lining up alongside each other on the third row of the grid for race one, Neal fought through to snare the runner-up spoils behind the wheel of his Honda Civic Type R, pulling off a spectacular wheel-to-wheel pass on Rob Austin down the Craner Curves along the way. On maximum success ballast by dint of his championship lead, Shedden grittily clung on to finish seventh. With both men on the harder-compound tyre in the day’s second outing, Shedden exhibited all of his remarkable car control to pull off an astonishing save on his way to sixth, with Neal – grappling with 66kg of ballast following his race one heroics – not far behind in seventh. 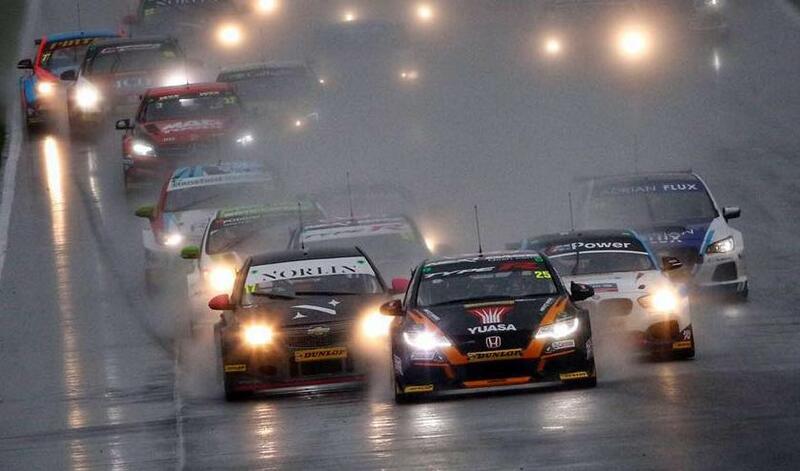 Defending champion Shedden then produced a virtuoso performance to speed to an unchallenged victory for Halfords Yuasa Racing in the rain-soaked finale, but a late sting in the tail saw him excluded from the results over a technical infringement. Neal was similarly luckless, as he found himself caught out by the conditions and beached in the gravel trap. Although the action was red-flagged with numerous drivers off-piste, outside assistance to extricate the Honda ruled the three-time title-winner out of the re-start. The results mean Shedden and Neal will travel to the next outing at Thruxton sitting respectively fourth and eighth in the Drivers’ table, with Honda and Halfords Yuasa Racing second in both the Manufacturers’ and Teams’ classifications.